The Monk Antonii (Anthony) of Pechersk was born in the year 983 not far from Chernigov, at the locale of Liubech. Possessing the fear of God from his youthful years, he desired to be clothed in the monastic form. Attaining maturity of age, he set off wandering, and having reached Athos, he burned with the desire to emulate the deeds of its holy inhabitants. Here he received monastic tonsure and in everything the young monk pleased God in his asceticising upon the path of virtue; he throve especially in humility and obedience, such that all the monks did rejoice to look upon his holy life. The hegumen foresaw within Saint Antonii the great future ascetic, and on an inspiration from God, he sent him off back to his native land, saying: "Antonii! It is time for thee to guide others also into an holy life. Return to thine own Russian Land, and be thou upon thee the blessing of Holy Mount Athos, so that from thee shalt come a multitude of monks". Having returned to Rus', Antonii began to make the rounds of the monasteries about Kiev, but nowhere did he find that strict life, which had drawn him to Athos. 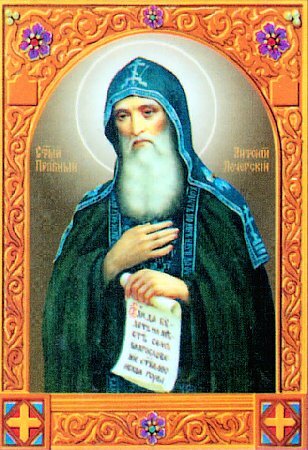 Through the Providence of God, on one of the hills of Kiev at a steep bank of the River Dneipr, reminiscent for him of the beloved Athos, in a forested area near the village of Berestovo, he espied a cave, dug out by the Priest Ilarion (who afterwards became Metropolitan of Kiev, Comm. 21 October). He began to asceticise there in prayer, fasting, vigil and work, eating over the course of a day but a bit of food, and sometimes he did not eat throughout the week. People began to come to the ascetic for blessing and counsel, and some decided to remain thereafter with the saint. Among the first disciples of the Monk Antonii was Saint Nikon, who in the year 1032 tonsured at the monastery the similarly arrived Monk Theodosii (Feodosii) of Pechersk (+ 1074, Comm. 3 May). The holy life of the Monk Antonii brightened all the Russian Land with the beauty of monastic striving. Saint Antonii received with love those yearning for monasticism. After instructions on how one ought to follow Christ, he bid Blessed Nikon to tonsure those willing. When 12 men had gathered about the Monk Antonii, the brethren together dug out a large cave and within it was built a church and cells for the monks. Saint Antonii, having appointed Blessed Varlaam as hegumen over the brethren, himself withdrew from the monastery, and having dug out for himself a new cave, he secluded himself within it. But there also, around the place of his seclusion, monks soon began to settle. Thus were formed the Nearer and Farther Cave monasteries. Afterwards over the Farther Caves was built by the monk a small wooden church in honour of the Uspenie-Dormition of the Mother of God. At the insistence of prince Izyaslav, the hegumen Varlaam withdrew to the Dimitriev monastery. With the blessing of the Monk Antonii and with the general agreement of the brethren , there was chosen as hegumen the meek and humble Theodosii. During this time the number of brethren had already reached an hundred men. The Kiev Great-prince Izyaslav (+ 1078) gifted to the monks the hill, on which was built the large church and cells, and around it was built a palisade wall. Thus was established the reknown monastery, which was called the Pechersk, foundationed over the caves. Giving the account of this, the chronicler remarks, that many a monastery exists built by rich emperors and nobility, they however cannot compare with those, which are built up by the prayers of saints, and by their tears, fasting and vigil. And thus though the Monk Antonii possessed not gold, he raised up by his efforts a monastery, incomparable with others, which became the first spiritual centre of Rus'. For his holiness of life, God glorified the Monk Antonii with the gift of foresight and wonderworking. In an especial instance this occurred during their construction of the Great Pechersk church. The MostHoly Mother of God Herself stood before him and the Monk Theodosii in the Blakhernae church (in Byzantium), whither they had been miraculously transported and enraptured, without having left their Pechersk monastery (Vide account of this under 3 May, regarding the Kievo-Pechersk Icon of the MostHoly Mother of God). Having received gold from the Mother of God, the saints commissioned master-architects, who on the command of the Queen of Heaven set off (from Byzantium) to the Russian Land for building the church at the Pechersk monastery. During this appearance the Mother of God foretold the impending death of the Monk Antonii, which occurred at age 90 on 7 May 1073. The relics of the Monk Antonii, through Divine Providence, remain concealed.